Resverchron™ is the first chronobiological regimen that offers broad-spectrum support for healthy aging, based on four millennia of knowledge from both Eastern and Western sources. Resverchron™ is a well-balanced combination of the best-researched vitamins, minerals, nutrients, and plant substances for supporting healthy cellular inflammatory processes, helping to protect against oxidative stress, maintaining a healthy cardiovascular and nervous system, and promoting healthy cell growth. Even necessary biological processes like the transformation of food into energy have a down side; as we age, it gets harder and harder for our bodies to cope with the residual damage these processes ultimately cause. Along with nutritional deficiencies, the unavoidable side effects of these processes trigger 50 to 70 percent of the health concerns which affect us today. Meanwhile, aging itself has become the most critical risk factor for all of the ailments that will determine our fates in the 21st century: cardiovascular disease, dementia, diabetes, osteoporosis, and even cancer. Promoting healthy aging naturally requires protecting against the two major contributors to un-wellness: hidden unhealthy inflammatory responses within the body and oxidative cell damage caused by free radicals. Internal stress triggered by silent unhealthy cellular inflammatory processes can go unnoticed for many years. These unhealthy processes, however, can play an essential role in paving the way for many major age-related ailments. Our cardiovascular system is particularly affected, and the relationship between these processes, cardiovascular disease, and a weakened immune system has been thoroughly investigated. Inflammatory markers in the blood can also be indicators of other issues such as decreased cognitive function, unhealthy cell growth and function, metabolic concerns, and conditions like osteoporosis. Healthy cellular inflammatory processes are normal mechanisms of healing which the body employs to ward off infections and pathogens. These healthy processes are triggered by certain food molecules, namely omega-6 fatty acids, and halted via their natural antagonists, omega-3 fatty acids. The problem is that in our modern human diet, the pro-inflammatory omega-6 fatty acids, especially those found in industrially-processed vegetable oils, outweigh omega-3 fatty acids such as those found in cold-water fish, walnuts, linseed, rapeseed, and help, by as much as twenty-to-one! This imbalance contributes to unhealthy cellular inflammatory processes in all of the body’s organs. The vital process of metabolic energy production involving the use of oxygen is naturally accompanied by the risk of continuous cell damage from oxidative stress. Oxidative stress, which occurs when the cell is attacked by aggressive oxygen molecules, may be compared to the rusting or oxidation of iron. Our body contains over 100,000,000,000,000 mitochondria, miniature “power plants”located inside each cell which are responsible for the formation of chemical energy carriers. In each of these tiny structures, tens of thousands of oxygen atoms turn into explosive objects called free radicals every single second, just because they’re missing a single electron. These free radicals wrestle an electron from another molecule, and in doing so turn their victim into a radical atom as well. This triggers a chain reaction of unimaginable dimensions! The protective mechanisms of our cells are able to cope to a certain degree; but our lifestyles, environmental toxins, the electromagnetic radiation of laptops and TV screens, harmful effects of stimulants like coffee, alcohol, tobacco, and even stress have the potential to multiply these aggressive molecules. Ultimately, oxidative stress can lead to cell destruction. When too many cells are affected too quickly, we age prematurely – if left to continue unchecked, entire organs may cease to function properly. At some stage of their lives, millions of people will have to combat one or several of the following three major threats: cardiovascular concerns, cognitive decline, and unhealthy cellulargrowth and function. For the first time, modern scientific research has discovered ways to help promote healthy aging using special plant substances, or “new phytamines.” These plant substances evolved to fulfill specific functions in plants, such as offeringprotection against heat and cold, but also help protect the plant against viral, bacterial and fungal pathogens and other disease factors. Plants have developed these phytochemicals throughout time because they are physically unable to evade attacks. Ancient civilizations revered Nature’s treasure trove of herbs and plants andhave understood their significance for some 10,000 years, during which they have been able to achieve astonishing effects through the use of these botanical substances. The Resverchron™ regimen is focused around bioactive secondary plant substances with strong anti-oxidant properties, many of which also promote healthy cellular inflammatory processes. 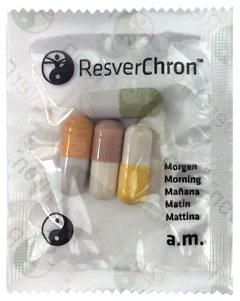 In keeping with the most valuable findings of Far Eastern and Western medicine, Resverchron™ successfully combines several dozens of standardized and pharmaceutically pure constituents together in one unique scientific formula. In Resverchron™, this holistic “East-meets-West” philosophy spans a geographically wide range of phytochemicals including green tea, the well-known health-protective plant from Asia, certain berries used by Native American tribes, and the red wine polyphenol resveratrol, the super-phytonutrient from Europe that promotes healthy aging. The results that can be achieved through the use of these substances are continuously validated by clinical trials and by traditional Western medicine. 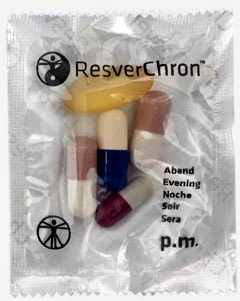 What’s more, the carefully-formulated AM/PM doses in the Resverchron™ regimen assure that essential vitamins, minerals, and vital substances are administered in the optimal combination at the right time of day, in tune with the principles of chronobiology. Acai berry: This Brazilian berry is rightly cele­brated as the newest super-fruit, and is a fine example of the knowledge explosion currently taking place in natural medicine. Largely unknown until recently, the acai berry is now recognized as a natural substance that can be used to sooth digestive and intestinal concerns, protect against fine lines and wrinkles and promote healthy skin, support vision and oral health, and help boost energy levels. Numerous scientific studies confirm the much-praised effects of this wonder-berry. Goji berry (wolfberry): A berry with anti-oxidative properties commonly used in traditional Chinese medicine,goji berry supports a healthy immune system and healthy cell growth. Mangosteen: This“queen of fruits” contains a wide range of vitamins, trace elements, and minerals. It has excellent free-radical scavenging abilities, proves to be efficient in supporting seasonal respiratory health, protects against germs, and supports healthy cell growth. Noni: The fruit of the Indian mulberry provides constituents which haven proven to be beneficial in maintaining healthy mood, maintaining healthy weight, supporting healthy blood sugar levels already within normal ranges, and protecting bone and joint health. Pomegranate: This “fruit of the gods” is known to help maintain a healthy immune system. L-Glutathione: This particularly strong antioxidant consisting of three amino acids supports internal cellular repair processes. Beta-carotene: The most important of a group of 400 carotenoids, beta-carotene is an essential precursor to vitamin A – a vitamin typically lacking in cases of heavy alcohol and nicotine consumption. Choline: This is a fat-like substance from which neurotransmitters (chemical messengers in the brain) are derived. It is recommended for promoting healthy mental performance. Inositol: Formerly known as vitamin B2, this antioxidant is one of the most important nutrients found in muscle tissue. Vitamin K: This is an important active ingredient involved in bone metabolism and blood coagulation processes. Lycopene: One of the most important “phytamines,”lycopene is found in high concentration in red tomatoes and rosehips, and its active ingredients help maintain a healthy cardiovascular system and support healthy cell growth. MSM: This biological sulfur compound is the main active ingredient of soothing sulfur baths. In its organically bioactive form, MSM also supports healthy cartilage renewal. Coral Calcium: This scientifically-developed preparation comprised of 73 trace elements regulates the body’s acid-base ratio and helps increase the pH value of the body’s tissues, thereby enhancing the absorption of vitamins, minerals, and nutrients. Beta-1,3-glucan: This polysaccharide (also referred to as the “police of the blood”) supports a healthy immune system, and remains effective after passing through the digestive system. Resveratrol: The polyphenol resveratrol is an extremely effective antioxidant usually obtained from the skins of grapes. Its general effects in the body are to help promote healthy cellular inflammatory processes and to protect cell health. Resveratrol’s mechanism of action is particularly beneficial to the blood vessels and cardiovascular system in general, which is eminently threatened by the aging process. Studies have clearly demonstrated some rather exciting effects. Resveratrol has been shown to support healthy cognitive function and enhance energy production in the mitochondria, the “powerhouses” of the body’s cells. It also protects cardiovascular health and supports healthy weight, healthy insulin levels, and healthy blood sugar levels already within normal ranges. Even the skeletal muscles have been shown to benefit from this polyphenol. Moreover, resveratrol is so far the only substance shown to prolong the lifespan of diverse organisms; an effect that has been repeatedly verified in cell cultures, mice, rats and in a fish species that is short-lived in captivity. Resveratrol also directly and positively influences the healthy aging process of cells through its simulation of calorie restriction (CR) and role as a recognized CR mimetic. Evolution has apparently provided humans with a “hunger survival mode.” In other words, the physiological stress caused by hunger unlocks the body’s natural arsenal of active ingredients to support healthy cardiac and metabolic activity as well as healthy cell growth. The reduction of energy (calorie) intake along with a whole food diet is one of the best-known and most thoroughly validated therapeutic approaches to healthy aging. Not only does this approach reduce the number of aggressive oxygen molecules that are released, but the simulation of calorie restriction also triggers an enhanced DNA repair process inside the cells which can help promote a healthy lifespan for each individual cell. Since 1989 alone, more than three thousand major publications on the different areas of action of resveratrol have been released. Grape seed extract: This ingredient promotes healthy oxidation of blood lipids, helping to maintain blood vessel health. Quercetin: Another important active substance of “red wine medicine,” quercetinowes its name to its yellowish color and to its origin – quercus is Latin for oak. Because high concentrations of this flavonoid are also found in grape skins, red wine that matures in oak barrels is particularly rich in quercetin. Quercetinhelps promote healthy cell growth and acts as a free radical scavenger. OPC: Another free radical scavenger found in grape seeds, OPC is approximately twenty times stronger than vitamin C and fifty times stronger than vitamin E. OPC is able to pass through the protective blood-brain barrier and even appears to protect healthy brain tissue, thus its reputation as a protector of healthy cognitive function. EPA, DHA: The most important omega-3 fatty acids are obtained from algae and fat-rich sea fish. The average amount of these fatty acids typically obtained from food is far below the amount recommended by scientists. A dramatic imbalance between omega-3 and omega-6 fatty acids is associated with an extremely high risk of disease. Omega-3 fatty acids EPA and DHA are available in pharmaceutically-pure form in softgel capsules. Pantothenic acid: This enzyme constituent, also referred to as vitamin B5, enhances the biosynthesis of numerous metabolic processes. Pantothenic acid is therefore beneficial for numerous physical conditions, including boosting energy levels. Biotin: This substance is also referred to as vitamin B7. It is involved in the regulation of gene functions and proves particularly beneficial when it comes to maintaining healthy mood and promoting healthy skin and muscles. Magnesium: Salts of this chemical element were originally discovered in the eastern Greek region of Magnisia, and its properties as a muscle relaxant wereappreciated as far back as ancient Greece. Anti-aging and orthomolecular medicine find it valuable for its beneficial effects on kidney and intestinal health. Bioperine®: As an extract, the active ingredients obtained from black pepper support the thermogenic activity of the human metabolism, which also helps improve the uptake of other substances. Royal jelly: A honey bee secretion vital to the nutrition of the queen bee, royal jelly contains carbohydrates, proteins, B vitamins, trace elements, fats, and amino acids. Supporting healthy cellular inflammatory processes: Protecting against inflammatory stress is crucial tohealthy aging. Evidence of this type of stress is provided by easily-detectible proteins in the blood called hs-CRP (high sensitive C-reactive proteins). In combination with coagulation factors, unhealthy cellular inflammatory responses are the driving force behind an unhealthy cardiovascular system and poor cognitive health. Oxidative stress: The substances in Resverchron™ help protect against free radicals through different mechanisms of action. Supporting a healthy cardiovascular system: The active ingredients in Resverchron™ work to support healthy oxidation and LDL-cholesterol storage in body tissues. Supporting healthy cognitive function: Markers such as hs-CRP also correlate with vascular concerns relating to the brain and cognitive function. Maintaining healthy genes and cells: DNA, our genetic material, and the cell structures of RNA (ribonucleic acid) are particularly threatened by aggressive oxygen molecules. Ingredients in Resverchron™ protect against free radicals while supporting healthy functioning of the cells. Promoting healthy cell growth: The secondary plant substances contained in Resverchron™ help promote healthy cell growth through various different mechanisms of action. Supporting healthy bones and joints: Healthy cellular inflammatory processes are important for the maintenance of healthy bones. Other Ingredients: Gelatin, rice flour, magnesium stearate, microcrystalline cellulose, calcium carbonate, calcium phosphate, silicon dioxide, titanium dioxide color, blue 1, red 3, red 40, yellow 5, yellow 6. Other Ingredients: Gelatin, rice flour, calcium carbonate, magnesium stearate, microcrystalline cellulose, silicon dioxide, calcium phosphate, glycerin, purified water, vanillin, hypromellose, medium chain triglycerides, inulin, tocopherols (preservative), titanium dioxide color, blue 1, blue 2, red 3, red 40, yellow 5. Dosage: As a dietary supplement, take the entire contents of the morning packet (AM) in the morning and the entire contents of the evening packet (PM) in the evening with 8 ounces of water.